Fukushima is still so contaminated that some areas will kill a worker within 30 seconds and is so bad it will destroy a robot making it all but impossible to work on. 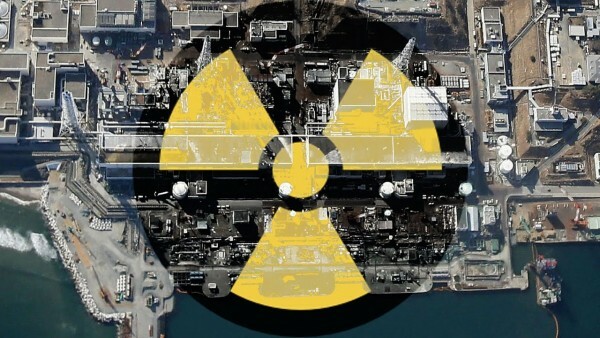 Fukushima, although new in many areas was based on old technology due to lack of development in Nuclear technology, largely due to the irresponsible actions of the USSR funded CND movement making R&D in nuclear physics both unpopular and controversial which has set back development by at least 30 years! Juan Carlos Lentijo of the International Atomic Energy Agency looks at tanks holding contaminated water and the Unit 4 and Unit 3 reactor buildings during a February 2015 tour of the tsunami-stricken Fukushima Daiichi nuclear power plant. (Photo: Susanna Loof / IAEA, Flickr CC BY-NC-ND 2.0)Almost six years after a tsunami caused a meltdown at the Fukushima Daiichi Nuclear Power Plant, the facility’s operator, Tokyo Electric Power (Tepco) faces overwhelming problems to clean up the site. Tepco now reports radiation in reactor 2 that would kill a worker in thirty seconds, and even destroys robots. 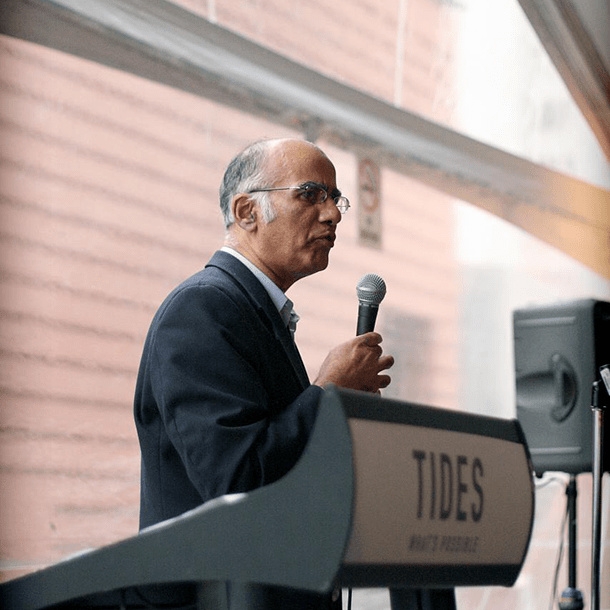 Arjun Makhijani, the President of the Institute for Energy and Environmental Research and host Steve Curwood discuss the implications of this new report and the challenges of cleanup. MAKHIJANI: Well, they are exploring the molten core of the reactor in reactor number two with robots, and the robot called Scorpion went farther into the bottom of the reactor in an area called “the pedestal” on which the reactor kind of sits and measured much higher levels of radiation than before. 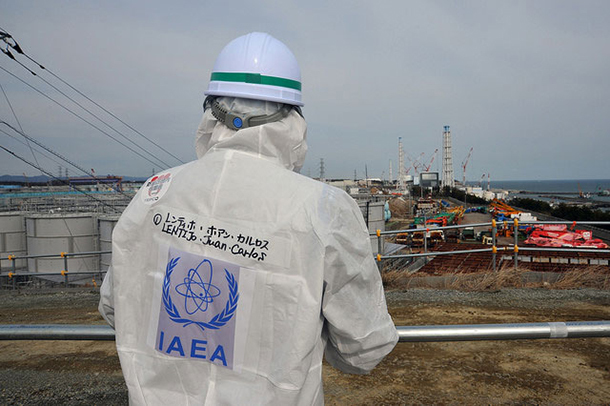 The highest level was 73 Sieverts per hour before and this time they measured a radiation level more than seven times higher. It doesn’t mean it’s going up. It just was in a new area of the molten core that had not been measured before. CURWOOD: Still, it sounds to me like it’s problematic, that six years after this meltdown there’s such a high reading. MAKHIJANI: It is a very high reading; they may encounter even higher readings. The difficulty with this high reading is that the prospect that workers can actually go there, even all suited up, becomes more and more remote. Robots are going to have to do all this work – That was mostly foreseen – but the radiation levels are so high that even robots cannot survive for very long. So now they’re going to have to go back to the drawing board and redesign robots that can survive longer or figure out how to do the work faster, and it’s going to be more costly and more complicated to decommission the site. CURWOOD: Remind us, Arjun, please, of the human impact of this kind of radiation. What’s toxic to humans? MAKHIJANI: So, it’s a very, very, very high level of radiation. That’s why people cannot go into the reactor and work there. That’s not the end of the bad news, but that’s quite a bit of it. CURWOOD: OK. All right, there is more bad news. I’m sitting down. Tell me. MAKHIJANI: Yes, so the bottom of the reactor under the reactor there is a grating and then under the grating there’s the concrete floor, and what this robot discovered — It was supposed to go around the grating and survey the whole area, but it couldn’t because a piece of the grating was deformed and broken. So, now it appears that some of the molten fuel may have gone through the grating and maybe onto the concrete floor. We don’t know because even robotic surveys are now difficult, and a high radiation turns into heat, so the whole environment around the molten fuel is thermally very hot, and so whether it is going through the concrete, whether it is under the concrete, I don’t know that we have a good grip on that issue. CURWOOD: So, Arjun, what’s going on with the reactors one and three? There have been published reports that TEPCO, Tokyo Electric Power Company that has these reactors, hasn’t really taken a good look at those reactors. What do you know? MAKHIJANI: Well, they have to develop the robots, and I think that developing them, by looking at reactor two, and they’re finding these surprises, radiation levels much higher than previously measured. It shouldn’t actually be unanticipated. The big surprise here was that a part of the grating was gone, and so that the molten fuel would possibly have gone through the grating. So, I think similar surprises will await reactors one and three because each meltdown will have a different geometry. CURWOOD: So, now what about the decay products here? We’re starting with the Uranium family, but we wind up with Cesium and Strontium – Strontium 90. What risk is there of Strontium 90 getting into groundwater there? MAKHIJANI: Yeah, so the peculiar thing about a nuclear reaction is the initial fuel, Uranium, is not very radioactive. It’s radioactive but you can hold the uranium fuel pellets in your hand without getting a high dose of radiation. After it’s gone through the nuclear reaction – Fission, that’s what generates the energy – the fission products which result from splitting the Uranium atom are much more radioactive than Uranium, and Strontium 90 and Cesium 137 are two of the products that last for quite a long time, half-life 30 years, and are quite toxic. So, Strontium 90 is specially a problem when it comes in to contact with water. It’s mobilized by water. It behaves like calcium, so if it gets into like sea water and get into the fish, the bones of the fish, or human beings, of course, it gets into the bone marrow and bone surface, increases the risk of cancer, leukemia. So it’s a pretty nasty substance, and Strontium 90 has been contacted with water. You know, rainwater goes and contacts the molten fuel. Groundwater may be contacting the molten fuel. So, we have had Strontium 90 contamination and discharges into the ocean. They also collect the water. 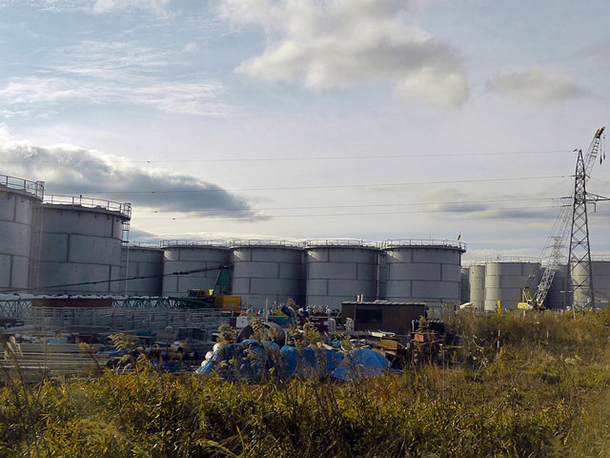 They’ve got about more than 1,000 tanks of contaminated water stored at the Fukushima site. By my rough estimate may be about 100 million gallons of contaminated water is being stored there. CURWOOD: What happens if there’s an earthquake? MAKHIJANI: That’s exactly right. So about a week into the accident, I sent a suggestion to the Japan Atomic Energy Commission that they should buy a supertanker, put the contaminated water into the supertanker, and send it off elsewhere for processing. 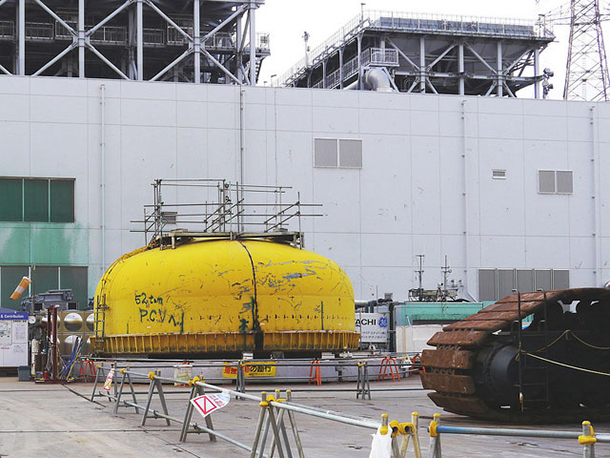 They do have a site in the north of Japan which was supposed to be for plutonium separation, but it could be used to support the cleanup of Fukushima. But they rejected that proposal more than once and decided to build these tanks instead. They have a decontamination process on-site, and there are a very vast number of plastic bags on the site filled with contaminated soil. Nobody wants the stuff and nobody knows what’s going to happen with it. CURWOOD: It’s six years after the original meltdown. How much of a disaster is Fukushima today?